The historic Lee County Courthouse celebrated the 100th Anniversary of its opening in December 2015, and a special reception was held in honor of the occasion. 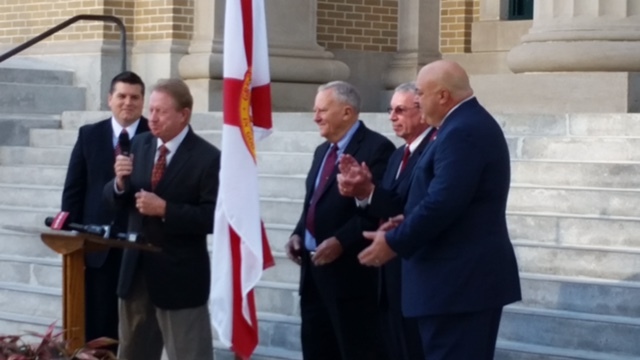 Lee County Commissioners invited the community to celebrate the 100th anniversary of the Old Courthouse on Tuesday, Dec. 1, 2015 on the steps of the historic building, 2120 Main St., Fort Myers. The public gathered outside the courthouse at 8:45 a.m. Chairman Frank Mann lead brief remarks by commissioners at 9 a.m., followed by a reception in the first-floor lobby. Then at 9:30 a.m. at the regularly scheduled Lee Board of County Commission meeting, Mann read a resolution recognizing the anniversary. The meeting was on the building's second floor in Commission chambers. The Old Courthouse wasn't built in a day – the cornerstone was placed in April 1915 – and one day just wasn't enough to recognize how important the building has been for generations of Lee County residents. Special Old Courthouse Tours were offered in November, and submissions were accepted of original, modern photos of the Old Courthouse for possible inclusion in the anniversary celebration. As part of the 100th anniversary, the Lee County Clerk of the Court's office collected items for a time capsule that was sealed in the clerk's vault in the building's basement in December. Watch the time capsule being sealed. In addition, Lee county residents were invited to submit their own memories of the Old Courthouse for inclusion in the celebration. Whether attending a speech or an auction on the courthouse steps, or watching Sean Connery film scenes for "Just Cause," those memories deserve to be shared. Please read the stories below. In 2011, due to disease and for safety reasons, the massive oak tree was removed. However, Commissioners decided to use part of the tree in a unique way. My first encounter with the Lee County Courthouse was when I moved to Fort Myers in 1958. Most of the things we did at that time – church, shopping, going to the library, etc. – we did “downtown.” There was no Edison Mall or much of anything past Page Field. We always drove by the beautiful Courthouse with the huge tree in front. I don’t remember going into the courthouse for any reason during those early years. However, after graduating from Fort Myers High School in 1966, I began applying for jobs and was hired to work in the Finance Department of the Lee County Board of Public Instruction, as it was called then. I worked in the “new” section of the courthouse on Second Street. During the years that I worked there, the old courthouse building was a cool shortcut from our office to shops and restaurants in the rest of town. At one time I was given a project to research and find old bank statements in order to close out accounts no longer used by the Board’s Finance Department. That project took me to what was called “the dungeon.” I worked there for several weeks. That “dungeon” was the basement of the old courthouse. That was over 45 years ago and I wonder sometimes what it looks like now. During the time I worked in the courthouse I got married. At that time, the marriage license bureau was in the old courthouse building. The day my husband and I applied for our license was exciting and daunting. Recalling that day’s impression of the beautiful courthouse, and its echoing halls with glass-windowed doors, is a great memory. I have many memories of the old courthouse. I began my career in the legal field in the early 1980s in downtown Fort Myers when the old courthouse was the only courthouse. I started out as a runner/receptionist for John Stewart and James Decker on Main Street. Exploring the halls and rooms (that I was allowed to access) for many years was always an adventure because everything was so old and history was right there under your nose. The clerk’s office was on the second floor and right across from the clerk’s office was recording. Hearings and trials were conducted in that old building. I remember the three original clerks from that time: Honey Edrich, Jane Cook and Joe Burke. I was working for Goldberg, Goldstein & Buckley when “Just Cause” was being filmed. A group of us stood across the street from the old courthouse and watched Sean Connery, Hope Lange, Kate Capshaw and others being filmed coming out of the courthouse. I was picked to be an extra in the film and got the pleasure of watching the bus scene being filmed. A $75 check was made payable to me from Warner Brothers for being an extra. I laser copied that check to keep. Ruby Dee smiled at me in wardrobe and Lawrence Fishburn winked at me as he was getting into a red convertible. Really good memories! An interesting tidbit: Sean Connery would not turn around and wave to his fans that called him Sean. If they addressed him as Mr. Connery, he would turn around, wave and smile. I have a lot of pictures showing the filming of that movie. I was the construction manager for the historic restoration of the old courthouse in 1988-89. Our goals were to bring the old building up to current safety codes, restore the original look and feel of the building and provide the Commissioners with Meeting Chambers (originally the courtroom), conference rooms, and offices for them and their aides. The project was turning out beautifully in the summer of 1989 and I wanted non-controversial artwork that would allow the building to be the star. I visited the historical society, looked through the archives of early 1900s photographs, selected about 35 to 40 black and white old photos that told the history of this area. We bought copies, had them matted with engraved labels and framed to match the oak in the Courthouse. Twenty five years later, there has never been a controversy about the “artwork” on the walls. My oldest son, Ben, was born in July, 1989, just two months before the grand opening on Sept. 22, 1989 and I imagine he was the youngest person in attendance that day. As Ben and younger brother Philip grew up, I became a volunteer coach in the South Fort Myers Little League and its president from 2002 to the present. In those years the league has won State of Florida Little League Championships in 2004, 2007, 2009 and 2010. Each time, I had the honor of addressing the Commissioners and introducing the players and coaches to be recognized with resolutions acknowledging their achievements. It’s very special to have the connection among profession, family and community service that I got to experience on those four occasions. I hope I get to experience that same feeling again in the near future for a fifth time. My first memory of the old courthouse was in 1959 when I was the manager of Mosby Engineering, Inc., at 1802 Broadway. The County made “blue prints” of record plats and other county documents in the basement. “Blue prints” were actually that, blue with white lines. They were made in a wet process, like printing of pictures from negatives. Today they are Xerox-type copies on white paper with black lines, but many still call them “blue prints.” The new six-story courthouse addition was under construction at that time. In the late 1980s I was the structural engineer for the remodeling that was done to the Commissioner's meeting room and other parts of the building. The architectural designs tried to restore the look and function of the original meeting room for the Commission. As a young social worker in the early 70s, I have very fond memories of going to court when Judge Wallace Pack was the only judge overseeing the juvenile cases and Gerane Beckler was the Clerk of the Juvenile Court. Judge Pack was a wonderful judge; always professional, fair, and approachable. For social workers, Gerane Beckler was our guiding star. She was well-organized, helpful, kind and had a great sense of humor. I remember the walks to the courthouse from our downtown offices and how beautiful and stoic the courthouse looked as I approached. The gorgeous Banyan tree out front was comforting and awe inspiring. I had never seen a tree like that before coming to Lee County. To me, it was a beautiful building and location. The courthouse was majestic and powerful with three levels of courtrooms and offices. The steps in the front commanded respect and the climb up made a person feel that whatever the reason for going there, it must be important. I felt honored to be entering through its doors, and recognized the significance and seriousness of our work on behalf of children and families. Not long after this period, a more modern addition was added to the back of the building, courthouse activities increased, more judges were serving families and juvenile court was relegated to a smaller courtroom in the basement with a low ceiling. I'm sure that by the time the new Justice Building opened, the judges serving in juvenile court were happy to move. But for those who had enjoyed the courthouse in all its splendor, it was bittersweet. For me, it was a special experience for which I am grateful. Note: Edited and submitted by his daughter, Kathryn Kelly, after his death. Saturday night in Fort Myers in the late 1920s was just like any Saturday night in a small town. My Dad did the weekly family grocery shopping downtown. While he tended to his task, his three younger boys, Allan, Tom, and I, attended the old Arcade Theatre, which usually featured some favorite cowboy western movies. My favorites were those featuring actors Tom Mix and Buck Jones. After the movie, we would meet my Dad on the green bench in front of the courthouse, near the huge oak tree and the very large banyan tree. My older brother, Nick, would see to it that we were safely deposited in my Dad's care before heading back uptown to meet of few of his school buddies and do what most teenagers do. I think they called it "hanging out," a phrase that covers a lot more territory these days. Dad always stopped at the local bakery and bought a medium-sized pie to share with his three small boys. All of us sat on the green bench and watched Dad divide this wonderfully magnificent blueberry pie into four equal pieces. It was simply delicious and I could never explain to anyone what a luscious treat this was for three hungry country kids. Even as an old man, I can still see and almost taste the nostalgia of sharing these memorable occasions with our Dad. When I think back so many decades ago to the perfect ending of a special Saturday night ritual, my memory of Dad and two brothers on the green bench in front of the beautiful courthouse is still so powerful. The green bench and the oak tree are gone now, but memories still jump back from the pages of the past; reminding me that nothing worthwhile is ever forgotten. The courthouse basement had many functions over the years: Evidence was kept there; supplies for the Cuban Missile Crisis; old books and documents were stored there; prisoners were kept in the north end of the basement before trials; and offices of the Clerk of Courts were down there. No ghosts that I know of but certainly a lot of history. Back in the 1950s, Mr. Frank Pavese represented an Estero family accused of cattle rustling. Frank Pavese said twice the judge postponed the case. One day, he walked by Sheriff Flanders "Snag" Thompson and Snag said, "Congratulations, you won the case!" Mr. Pavese said, "No sir, we haven't went to trial yet." "Nope, you won the case!" Snag said. You see, the old courthouse hired a new custodian and one day he smelled something funny in the basement. He unlocked the door and saw cow hides. Stinking to high heaven, the new custodian threw the hides out. Those hides were evidence so Snag was right, Mr. Pavese won his case. Local attorney Hank Hendry was just a young boy back in the 1960s. His father, Lloyd Hendry, was an attorney who used to bring his son to the courthouse while he conducted his business affairs. Hank, being a boy, explored the old courthouse basement. He recently told me that during the Cuban Missile Crisis, Lee County purchased about 50 large barrels of crackers. They were preparing to take shelter in the old basement in case Russia or Cuba dropped a bomb on Lee County. Hank actually remembers seeing the barrels. When I first came to the courthouse in 1981, I used to have to go to the basement. The Clerk's office had two separate offices in the basement and I would take the paychecks down there. Most of the doors were locked but one day I saw one of the doors opened and I looked inside. I saw tan color barrels and wondered what else was in the basement as it appeared to be loaded with many items. I went back upstairs and I asked my co-worker, Geneva Workinger, "What is in the basement?" Her reply to me was "There is nothing but crackers down there!" I thought she was pulling my leg and just laughed. It wasn't until I spoke to Hank Hendry and he told me the "cracker story" that I put two and two together. In the 1960s Stanley Ink along with Rick Debost were part of the Civil Defense in Lee County. Preparing for disaster, they filled the fallout water drums in the basement of the old courthouse with water. He remembers seeing many barrels of crackers in the basement. Mr. Ink believes the empty drums for water and barrels of crackers were delivered as part of the government establishing fallout shelters in cities all over the United States during the Cuban Missile Crisis. Mr. Ink did extensive training for a fallout shelter license. He was the owner of Ink Engineering in Lee County and has left his mark throughout Lee County history. I have 34 years of memories of the old Lee County Courthouse. In 1981, I was just a young woman that fell in love with the design and architecture of the building. The floor impressed me the most. When the Justice Center opened in 1983, everything and everyone from the courthouse moved there. The old courthouse sat vacant from 1984 to 1988. It was time for a facelift. While the restoration was going on, I would watch from the Administration Building windows and wonder how it was going to look in the end. Not many people know this but when the roof was removed, the entire roof was lined with copper. The basement was emptied out, the old antique furniture was put in storage and sadly many items were thrown away. In 1989, the courthouse was restored to its original condition. Today the first floor is very quiet, nothing like the old days but it is certainly a historic building that hopefully will last another 100 years! In 1960, Hurricane Donna paid us quite a visit. The courthouse was a shelter from the storm. As a Boy Scout, I volunteered to help folks who had to come to the shelter. It was quite an experience. We watched the winds fold boxcars like cardboard and blow the roofs off buildings that lined the rail tracks. The wind came from the north and south, so we could open the doors of the courthouse on the leeward side of the building. Mid-storm, a family tried to come into the courthouse through the west door while the winds were blowing from the North. I was a 120-pound sophomore at Fort Myers High School. I followed some adults out the door to help the family that was at the wrong door. As soon as I ran around the side of the building, I was stopped cold by the wind. Since I could not progress, I had to slide back behind the courthouse, out of the wind. I helped the folks after they got out of the wind. The courthouse held up pretty well during the storm – a few leaks and minor wind damage. We were constantly taking the stairs to the top floor to inspect for damage. After the storm passed, I rode home with Dr. Stewart. As we rounded Cortez Boulevard in front of the high school, we saw a couple of trees down in the street and what looked like a small hole in the road. Instead of proceeding, we got out of the car and determined we could drive over the trees but, not through the hole that was big enough to "swallow" Dr. Stewart's Porsche. We drove around the hole; over the trees. There are many courthouse stories, but my favorite was in 1949 and concerns then County Judge Hiram Bryant, who was brother-in-law to (Sheriff) Flanders "Snag" Thompson. He had a round desk next to the large open window on your right side as you came up the main front steps and which has been changed over time. When I was a brand new young lawyer and came up those steps for a trip to the Clerk's office I heard a sharp voice say "Young man – please come in here to my office." Naturally I did so and, as I came into Judge Bryant's presence, he asked my name and pulled a little booklet out of his desk drawer. He said, "Sit down – we have something important to talk about." Being young, innocent and astounded, I did as he said. He then said, "It is my understanding that you intend to run against me for County Judge and we need to discuss it." Being totally surprised, and having never had such a thought, I quickly denied such an intention. He opened his little book and wrote on a page the words: "James Franklin promises me he will never run against me for the office of County Judge. He then dated the page and handed it to me for my signature. I quickly signed it and it then went back in the desk drawer. He smiled and I left. I never saw the book again but guess it had several similar pages! I remember my first trial in 1960, an indigent aggravated assault case assigned to me by Judge Gerald, the first, at the sounding of the docket a week earlier. There was no public defender at that time, only an occasional new attorney who needed some trial experience. I showed up at the appointed time for trial in Mrs. Pickering's office, which together with Judge Gerald's office, occupied the area adjacent to the big courtroom. Several attorneys were waiting as well as Snag Thompson, our amiable sheriff. Snag asked me why I was there and I told him. I was then informed that my case would have to be dismissed because the states' only witness couldn't be found. Snag thought it his duty to explain to all young lawyers proper courtroom protocol not taught in law school and he told me to wander into the courtroom, find Frank Watson, the County Prosecutor, and ask him to nolle pros the case. I did and Snag walked over to apologize to Frank for not finding the witness who his deputies had tried all week to find. At that point I interrupted to say that I had interviewed the witness the previous day. "Where was he," asked the sheriff. "In your jail," I answered.